To Cite: Daryanoosh S M, Goudarzi G, Harbizadeh A, Nourmoradi H, Vaisi A A, et al. 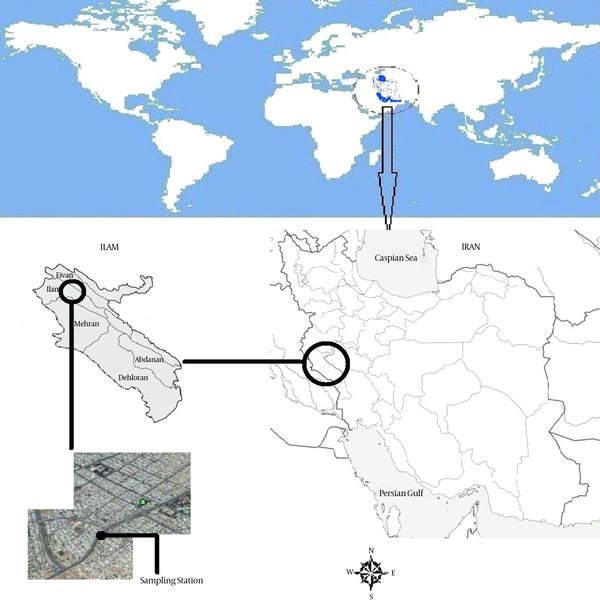 Hospital Admission for Respiratory and Cardiovascular Diseases Due to Particulate Matter in Ilam, Iran, Jundishapur J Health Sci. 2017 ; 9(1):e36106. doi: 10.17795/jjhs-36106. Background: Particulate matter with an aerodynamic diameter lower than 10 µm (PM10) has the most undesired adverse effects on human health. Several studies reported a strong correlation between PM levels and hospital admissions owing to chronic and acute respiratory and cardiovascular diseases. Objectives: The current study aimed to estimate the effect of PM10 as a primary pollutant on respiratory and cardiovascular hospitalizations in Ilam, Iran, in 2013. Methods: PM10 data was taken from the Ilam environmental protection agency. The annual morbidity including hospital admission for respiratory and cardiovascular diseases due to PM10 exposure were estimated using relative risk (RR) and baseline incidence (BI) based on world health organization (WHO) databases for AirQ2.2.3 model. Results: The results showed that the maximum level of PM10 was obtained in summer with a concentration of 491 μg/m3. The cumulative number of excess cases admitted to the hospital for respiratory and cardiovascular diseases were 216 and 84, respectively. Approximately 3.95% of the cases hospitalized due to PM10 occurred during days with concentration levels lower than 20 μg/m3. The highest rate of person-days related to PM10 that led to heath effect among Ahvaz inhabitants was in concentration levels of 40 - 49 µg/m3. Conclusions: To reduce the impacts of particulate matter on health status of people in Ilam, necessary training by health systems should be conducted for people, especially those with chronic lung and heart diseases, the elderly and children to reduce their activities on the dusty days. Air pollution owing to industrialization, population and urbanization is one of the major environmental problems in the world, especially in the developing countries (1-3). In recent decades, several studies revealed that urban air pollution is a cause of mortality and morbidity (cardiovascular and respiratory symptoms, decrease in lung function, chronic bronchitis, etc.). World health organization (WHO) reported about 800,000 cardiovascular and respiratory deaths annually in the world due to urban air pollution (4-6). Epidemiological studies showed that air pollution, especially particulate matter with aerodynamic diameter ≤ 10 μm (PM10), has a serious impact on the human health (7-9). PM10 can penetrate into the airways where they may exert adverse effects (10, 11). Several epidemiological studies showed an association between PM10 concentration in ambient air and respiratory diseases, pulmonary sicknesses and mortality among the exposed population (12). Results of the studies by the WHO showed that an increase of 10 µg/m3 in particulate matter level can lead to an increase of 1% - 3% in the mortality rate (13-15). Epidemiological researches illustrated that more than 500,000 Americans die each year owing to cardiovascular diseases associated with PM10 (12, 16). Ilam, the capital city of Ilam province, is located in the West of Iran and high quantities of air pollution for decades as a result of urbanization and hence, population growth and increased traffic-related air pollution. In the recent years, because of the Middle Eastern dust (MED) storms especially from the Arabian Peninsula, Kuwait and Iraq, the areas of South and Southwest of Iran are affected by PM10. MED storms lead to thousands of hospital admissions due to cardiovascular and respiratory diseases (17). The air quality health impact assessment (AirQ2.2.3) software is a program used to assess the health impact of PM10 (7, 14, 18). This model is a valid and reliable tool proposed by the WHO to estimate the potential of short-term impacts of air pollution on the human health. Several studies were conducted by Nourmoradi et al. (17), Zhou et al. (2), Shakour et al. (10), Gharehchahi et al. (19), Schwartz et al. (11), Dockery et al. (20), Hosseini et al. (16), Mohammadi et al. (21), Chen et al. (22) and Martuzzi et al. (13) to assess the air quality in terms of particulate matter and its health risks on the human. The current study aimed to assess the association between PM10 concentration and hospital admission due to respiratory and cardiovascular diseases in Ilam in 2013. Ilam (33°36’N, 46°36’E), the capital city of Ilam province, is located in South-West of Iran. According to the latest census report, this city has a population of 170,000 persons. Ilam is developing and non-industrialized. Figure 1 shows the location of Ilam sampling station. Where AP and RR (cc) are the attributable proportion of the health endpoint and relative risk for a certain health impact in the group c of exposure, respectively. Moreover, P (c) is the proportion of the target population in the exposed group (18). The amount of various attributable to the population exposure can be found by the following equation, if the baseline frequency of the health impact in the studied population is identified (Equation 2). Where IE and I are the amount of health impact related to the contact and the baseline frequency of the health endpoint in the population, respectively. Finally, considering the population size, the total number of excess cases associated with the exposure is identified by Equation 3. Where NE is the number of cases assigned to the exposure and N is the total number of assessed residents. The RR gives the increase in the possibility of the adverse endpoint associated with a given change in the exposure levels, and comes from time-series studies where day-today changes in air pollutants over long periods were related to daily mortality, hospital admissions and other public health indicators (23). In the epidemiological studies, the relative risk (RR) is the possibility of developing a sickness resulted by the contact to a pollutant. The health endpoints associated with the PM10 were estimated using AirQ version 2.2.3. Exposure was assessed considering Ilam with a residential population of 170,000 persons. The model assumes that PM10 measured data are representative of the mean exposure of the people. Finally, the numbers of cases for hospital admissions for respiratory diseases and hospital admissions for cardiovascular diseases were calculated. The values of relative risk and related baseline incidence were accepted from data files of the AirQ2.2.3 software. The values of RR and BI were taken from the studies by Zallaghi et al. (18) and Shahsavani et al. (7) (Table 1). Abbreviations: BI, baseline incidence; RR, relative risk. The results presented in Table 2 showed that the annual average of PM10 in Ilam during the study was 77.67 μg/m3. The summer average concentration of PM10 with the value of 88.57 μg/m3 was higher than that of winter by a mean of 55.85 μg/m3. The annual maximum concentration of PM10 was higher in the summer than the winter, with the observed maximum concentration of 491 μg/m3 in the summer. Table 3 shows the relationship of PM10 concentrations with the percentage of attributed proportion, and the number of people admitted to hospital for respiratory or cardiovascular diseases according to the relative risk (RR) and baseline incidence (BI) presented above (Table 1). Accordingly, the cumulative numbers of estimated excess cases with hospital admission due to respiratory or cardiovascular diseases were 216 and 84, respectively. Figure 2 indicates the results of quantification of hospitalizations and the numbers of consequences obtained from AirQ software explication versus PM10 concentration interval in Ilam. Figure 2 shows charts based on the cumulative number of each health outcome and number of excess cases in three styles (5%, 50% and 95% RR). There are three curves for each chart (including lower, medium and upper). The middle curve corresponds to a RR of the central. Lower curve is in relation to a RR of 5% (underestimate) and the upper curve is associated with a 95% RR (overestimate). Also, based on Figure 2, the cumulative number of hospital admissions for respiratory and cardiovascular diseases in the central relative risk, as idle curve, was 216 and 84 persons, respectively, in Ilam. In addition, there was a steep increase in the concentrations of higher than 120 μg/m3 related to charts of the estimated hospitalizations. Moreover, about 3.95% of hospital admissions associated with PM10 happened on days with concentration levels less than 20 μg/m3 and 81.07% of these effects occurred due to PM10 concentrations lower than 120 μg/m3. More than 98% of the cumulative number of hospital admissions for respiratory and cardiovascular diseases occurred on days with PM10 concentration not exceeding 200 µg/m3 in Ilam. The highest percentage of person-days that people in Ilam were exposed to different concentrations of PM10 was 40 - 49 µg/m3, which affected inhabitants of Ilam. In the current study, hospital admissions due to exposure to particulate matter (PM10) using the WHO method in Ilam was assessed by AirQ2.2.3 model. This software is applied in several epidemiological studies in the world to evaluate health impacts of air pollutants (25-28). 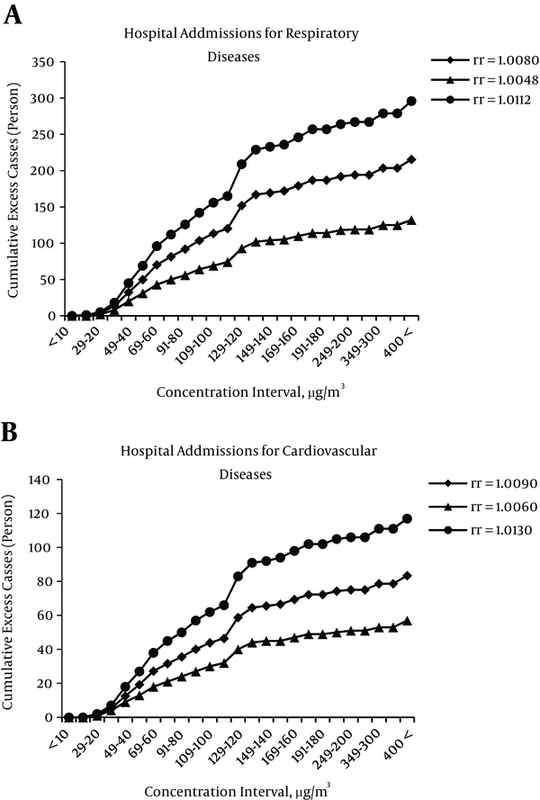 Hospital admissions due to respiratory and cardiovascular diseases were estimated based on short-term exposure to PM10. Based on the description of model, three ranges of relative risk including upper, central and lower were considered. The annual means of 24-hour, summer, winter and 98 percentile were 77.67, 88.57, 55.85 and 257.6 µg/m3, respectively. The mean of PM10 in Ilam was lower than that of national ambient air quality standard (NAAQS) with 24-hour average standard of 150 μg/m3. Zallaghi et al. illustrated that the annual, summer, and winter mean concentration of PM10 in Kermanshah were 89.54, 117.91 and 60.06 µg/m3, respectively (18). Nourmoradi et al. reported that the mean concentration of annual, winter and summer of PM10 in Khorramabad in 2014 were 58.28, 102.90 and 80.59 μg/m3, respectively (12). Higher level of PM10 during summer was probably caused by high temperature and high wind speed that led to increase of atmospheric turbulent and resuspension of dust from the blowing sand particles of the Middle Eastern areas (29). The annual mean and annual maximum of PM10 in Meca, Saudi Arabia, were determined 195.5 and 782.1 µg/m3 (29), which were more than the results of the current study. One limitation of the present study was that in the assessment of the software model, similar to other studies using this method, it was assumed that a causal correlation existed between the exposure to air pollution and health condition assessment results and there was no intervening factors affecting this relationship. In a similar study in Kurdistan, Hosseini et al. showed that then number of cases admitted to the hospital for respiratory and cardiovascular diseases were 118 and 305, respectively (16), which were higher than the results of the current study. Nourmoradi et al. illustrated that the number of admitted cases in the hospitals for respiratory and cardiovascular diseases in Khorramabad were 507 and 201, respectively (12), while these measures were 216 and 84 in the present study. Mohammadi et al. reported that the number of excess cases hospitalized for cardiovascular diseases were 32 in Shiraz in a middle RR and BI of 373.6 (21). In a study in Tallinn, Estonia, the total numbers of cases admitted to hospital for respiratory and cardiovascular diseases due to exposure to PM10 were 71 and 204, respectively, with the 95% confidence interval (30). In another study, a significant association was found between PM10 levels and hospital admission for respiratory disease with a centerline relative risk of 1.14 (1.01 - 1.29), especially in the cool season than in the warm season (22, 31). The results of the current study showed that 38.98% of the hospitalizations occurred in PM10 concentration lower than 50 µg/m3 and 93.79% for the cases admitted to the hospital for respiratory and cardiovascular diseases in PM10 level not exceeding 150 µg/m3. Yavari et al. showed that about 13% of the health endpoints attributed to PM10 occurred in concentrations lower than 20 µg/m3 (32), whereas, in the present study, only 3.9% of the cases were hospitalized in concentrations not exceeding 20 µg/m3. The highest rate of person-days related to different levels of PM10 was observed in the concentration interval of 40 - 49µg/m3, which caused hospital admissions due to respiratory and cardiovascular diseases in Ilam. Fattore et al. showed that the highest rate of days that people in Milano were exposed to different PM10 levels was in concentration levels of 40 - 49 µg/m3. This result was also consistent with the results of present study and the study by Hosseini et al. in Kurdistan in 2013 (16). The current study aimed to estimate the number of excess cases attributed to PM10 in Ilam, in 2013. The results of the study were in line with those of other researches and despite the limitations, indicated that this method offers an effective and easy tool helpful in decision-making. In addition, further studies with specific RR and BI according to geographical, climatic and statistical features were required. To reduce the health impacts of the particulate matter in Ilam, necessary trainings by healthcare systems should be provided for people especially those with chronic lung and heart diseases, the elderly and children. Furthermore, the attempts should be made in the governmental scale to control the Middle Eastern dust storms (MED) sources. Other implemented actions include increasing green beltway in Iran-Iraq borderline, management of water bodies and planting some new plants in the internal sources can be effective in the decreasing dust episodes. The authors appreciate the vice chancellery for research at Lorestan University of Medical Sciences, Khorramabad, Iran, for financial support.